An adventure full of comedic miscommunication, history and heart! No man is an island unto himself. An English sailor, shipwrecked on a remote island, works against all odds to survive alone for 25 years. Until one day, he rescues a stranger from brutal savages and the two develop a remarkable friendship. Adapted from the classic novel by Daniel Defoe, this imaginative retelling emphasizes communication, embracing cultural differences and empathy. 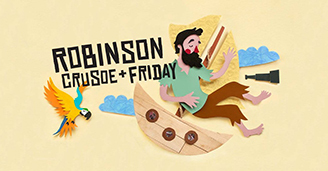 Set sail with Robinson and Friday on an adventure full of comedic miscommunication, history and heart!